I barely get to conduct these beer blogs anymore. My job is taking up all my drinking time. This is a pretty good beer. This dark Swedish beer (the Swedes aren’t known for their beer, are they?) comes off smoky, malty, a little ashy and bitter, and I swear there’s a barrel aging involved here but I can’t find any evidence backing up that statement. All the flavors taste well balanced and give me a ‘goes hand in hand’ impression. That’s all I have for this above average smokebeer. Overall happiness factor – 5 out of 7 smokestacks. Brewer’s Description The aroma is complex with the character of toffee and dried fruit and smoked charcuterie. A finessrik rökkaraktär penetrates then forward and asking for attention. 80 per cent of the malt Nils Oscar Rökporter is smoked over beechwood. The remaining malt are three kinds of toasted malts in different shades and caramel malt. 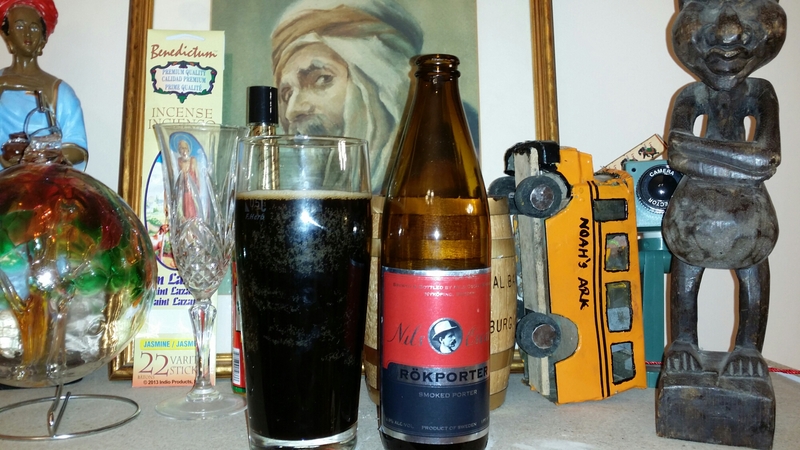 Nils Oscar Rökporter is spiced with hops varieties Fuggles and Amarillo. Image | This entry was posted in Beer, Educate, Enlighten, rauchbier, Smokebeer and tagged 5 - 6, beechwood, Nils Oscar, porter, Sweden. Bookmark the permalink.